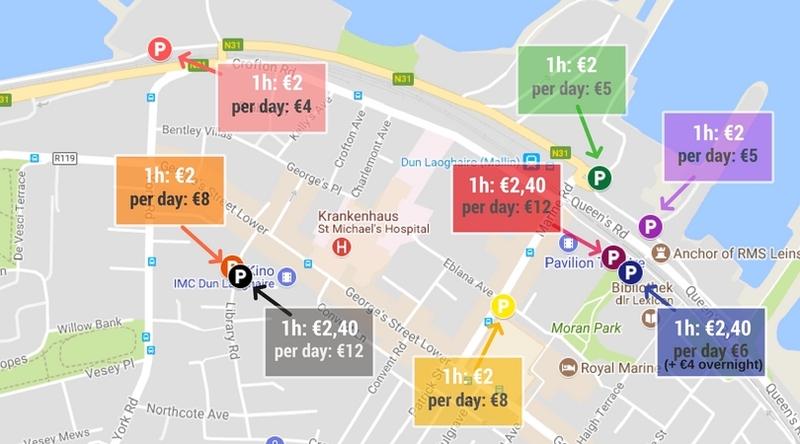 In Dún Laoghaire there are about 4500 parking spaces in total which is more than in Dundrum. About 570 are on street parking spaces. Parking on street will cost you €1.50 for 60 minutes plus the 15 minutes grace period however, there is a maximum of 3 hours. There are some places where you can park all day where the ticket costs vary between €4 and €12 . Weekly, Monthly & Student Rates available. Contact car park. Special Saturday & Sunday rate from opening until 7pm- max charge €6.00. If you spend over €30 or more at SuperValu Dun Laoghaire, SuperValu will deduct the cost of one hours parking from your ticket. The IMC Car Park offers 2 hours 30 minutes free parking when visiting the cinema.Validate your car park ticket in the cinema and enter it in the pay station before returning to your car. An on street parking study in 2016 found out several facts about parking habits in Dún Laoghaire Town. About 570 spaces were surveyed over a two week period. We created a short overview which will help you to find your perfect parking space in town.